Anybody who has ever worked in a shop, bar, supermarket or other job where stock rotation is encouraged, will agree that, were there ever any justice in the world, a product’s sell-by date should be a whole lot further away than one week of putting it on the shelf. 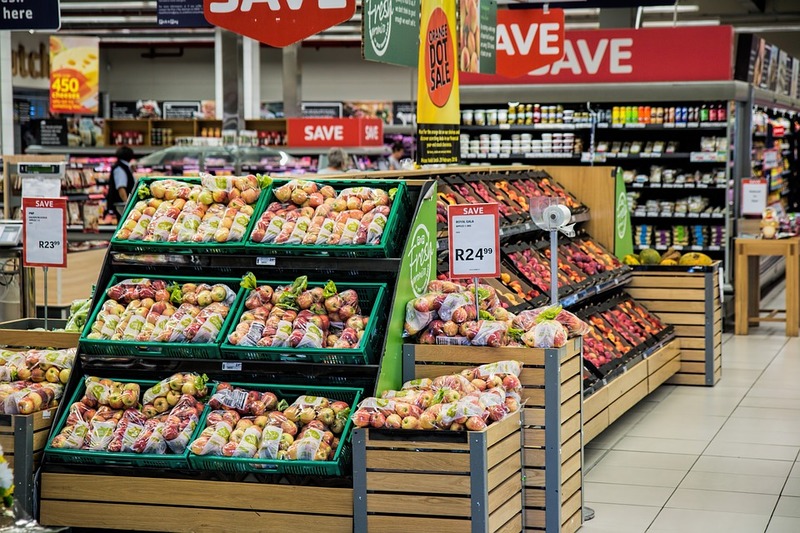 Stock rotation is an essential task: it means the products which are going out of date the earliest are always those found at the front of the shelf. It minimises waste, and helps workers avoid leaving unsafe products at the back of shelves just waiting to be sold accidentally. However, it’s also a laborious chore which we’d give anything not to do. We’ve all broken bottles or burst milk cartons by accidentally knocking them onto the ground reaching into the far depths of a shelving unit. So, here’s a quick breakdown of the five best solutions to stock rotation tedium out there! Back-loading fridges are a classic solution to the stock rotator’s dilemma. They work by having a front and back door. 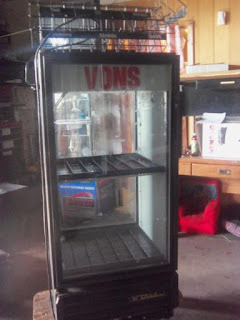 In a pub or shop, the former would be on view to the customers, whilst the latter would be poking through a hole to the other side of the wall against which the fridge rests. 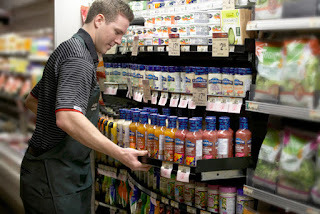 When stock gets low, the worker’s job is simply to walk to the back room (which is also, conveniently, where the stock is usually kept), open the back doors of the fridge and fill it up directly from the back. That way, the oldest products are at the front and the newest at the back. Simple, cheap, effective and quick. Besides the fact that loading from the back makes it hard to know where the edge of the shelf is (meaning it’s possible to shove stock too far onto the shelf and knock the front product onto the floor), the main problem, really, is space. Such units need a lot of space behind them: enough for a worker to swing the back door open and stand behind the fridge with a box of stock filling the shelf. The layout of the building itself has to be just so, to allow for a stock room behind the fridge or shelving unit. So, whilst big pubs, warehouses, and other large buildings can take advantage of these fridges, most establishments can’t incorporate them. Even if you’re not rotating stock, just getting products onto high shelves can be a real chore. That’s where Stock & Roll comes in: a shelf on wheels which can go where you go. Manual handling can certainly be a dilemma – especially when you’re bending down to lift products off the floor. If they’re on a platform closer to the shelf, you’re less likely to sustain injury or need to exert yourself so much. However, a potential problem with this product is simply the fact that you have to get the products onto the Stock & Roll shelf to begin with – because, at the end of the day, you have to get the products from the floor of the stockroom up to the dizzying heights of the shelf somehow. The Stock & Roll is innovative – but might, for some, be more of a hassle than a help. Since most shops and businesses can’t afford the room which back-loading shelves take up, POP Shelves can undoubtedly come to the space-efficient rescue. If you’re not completely sold on POP Shelves after watching this video, then you’re perhaps unreachable. The shelves work through the use of a pull-out platform underneath the shelf you’re trying to stack. With the pull-out section extended, you can slide the products you want to move from the back of the shelf onto the front of the extended section, load the new products onto the back of the shelf, then move the old products back onto the front of the shelf from the extended section, and slide the extending section back into place. What a great idea – and space-saving, too. No more putting stuff on the floor to stack it; no more knocking stock onto the ground. The only problem seems to be the fact that there’s a little drop downwards to the extended section from the shelf: meaning that although you can slide the old products off the shelf, they still need to be replaced one-by-one as they can’t be slid back onto the shelf (as they would if the seam was flush). What’s more, if the products you’re moving around are fragile (like eggs) you probably won’t want to slide them off a drop at all. Still, for most products, this would be a real time saver, especially since you can rest your box of new stock on the extended section rather than, say, the floor. If POP Shelves didn’t catch your fancy, there’s a good chance it’s because you’re already familiar with their slightly different, and slightly better, cousin: full-blown pull-out shelves. These do essentially all the things a POP Shelf can do; except without the need to slide the product around multiple areas of a shelf. Simply pull the whole thing out, push the old stock to the front, put the new stock at the back, and return the whole thing to its starting position. They are an absolute life-saver when it comes to product rotation, checking products for damage, counting products on the shelf and so on. Simple, simple, simple. When all else fails, you can always fall back on worker know-how. Nothing’s a substitute for experienced workers. Even if you can’t invest in any of the above gadgets and gizmos, simply having staff who are happy to work, know what they’re doing, and are capable of burning through product rotation quickly and efficiently is oftentimes enough to ensure the product rotation gets done. If the team is big, it’s often hard to keep track of who was meant to rotate products on the shelves – and if it doesn’t get done it’s the fault of the whole team, not any individual. So, the best way to get product rotation done is to make sure staff are willing to do it. Happy workers, busy workers; busy business, happy business.